How much weight can I lose in a month - 5 Epic Hacks! 5 Answers for when you ask How much Weight Can I lose in a month ? How committed are you to slimming down? How much do you want to have a flat stomach? How badly do you want to finally see your abs? When you ask how much weight can I lose in a month, the answer will come from you. Statistically, you can potentially see a weight loss of 8 – 10 pounds and if you add some walking and pushups, you will see changes to your physique in only a month. There is also a good chance that you can even see a more dramatic melting of your fat. What are your simple guidelines for the next month? 1. Stop today, right now, stop eating refined carbohydrates. That means bread, pasta, rice, white potatoes. The reason is that you want to minimize the amount of insulin that your body has to produce in order to deal with the resulting flood of glucose that happens after you eat very starchy foods. When you have too much glucose in your system constantly, your body has to secrete an overload of insulin to deal with it, to remove the glucose from your bloodstream, and as fate will have it, many of us who struggle with losing weight, our bodies require too much insulin to do the job which ends up shuttling all of that glucose into our fat cells. Stop the glucose flood, stop the insulin flood, start to lose the fat, slowly but surely as your body will fight to be in balance. This is the first golden rule to follow when you want to know how much weight can you can lose in a month. 2. Stop drinking your calories, right now, today, no mas. Drink water, tea or even coffee, but please stop drinking soda. This should be pretty self explanatory, soda and juices are full of liquid sugar which require almost no processing by your own body and they are immediately drawn into your bloodstream, a real glucose downpour. 3. Eat real food as much as possible, mainly vegetables, fruits, seeds, nuts and protein. How much sugar is there is a vegetable? Not much, pretty much nothing. In seeds, nuts and protein the answer is the same, not much sugar. There is natural occuring sugar called fructose in fruits, but believe it or not, you can still have several servings of fruit a day and still watch your weight drop miraculously. Fruits have important vitamins and micronutrients and taste good, plus they take a bit of time to break down the fructose into glucose in your body. I think five servings of fruit should be enough to keep you a happy camper if you are craving something sweet. For the lowest glycemic load, stick to berries, apples, but feel free to have a banana or two a day. Just make sure that you are not sacrificing vegetables for fruit, vegetables are king and they should be your focus in every meal. 4. Take an hour walk every day, you can do it, build up to it, but get moving. You will be shocked how great you will be feeling if you just add this one habit to your everyday life. Walking is going to engage 70% of your muscle mass and will wake up the mitochondria, your little energy factories and help to reactivate them to burn glucose. Do not be surprised if after every morning walk, you actually see another half to a full pound of weight loss till you reach your ideal weight. Listen to music or a podcast or anything motivational and sure, if you want to frighten yourself, listen to the news, but my suggestion would be something more productive than world chaos. And I am not talking about walking like a race walker or power walker, we are speaking about a moderate walk, the type of walk that you can easily do for an hour. How great is that? 5. Start doing pushups and airsquats, even if you can only do one, do one today and keep adding on to your max reps. It is time to start putting on muscle, so lets start gradual but make sure to add a little every day or every other day. When you start to get up to bigger numbers like 100 pushups, you will want to skip one day so that your muscles can recover, but lets get some muscles to begin with! That is it. Do this for a month and come back and tell me how it went. You can start the month of October, lets see how you are doing by Halloween, perhaps your neighbors will not recognize you! I thought that it might be useful to you to follow a new client of mine who asked me that exact question How much weight can I lose in a month? He told me that last night he was in bad shape, bingeing on cookies and ice cream after a full sunday watching football over chips, beer and greek lemon chicken soup with hot greek pita bread. He said that his wife was very disappointed in his weight gain which happened slowly over the course of the 5 years that they have been married. He went from a slim 180lbs to a puffed out 205lb balloon. He said that he was practically crying and just desperate to find a way to lose weight, to lose his fat and find a way to earn his self respect and self confidence back. He had been to my site many times over the last few years and saw the changes that I had made and he decided to have me coach him over the next month. I think that starting at 205lbs, I think that he will definitely be down to 190lbs by the end of the month. Let's see how much weight he can lose in a month. 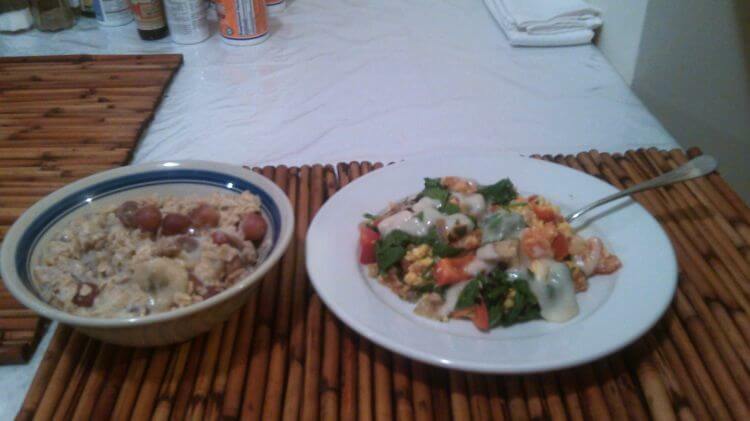 How much weight can I lose in a month program for Brian R.
Two egg omelete sauteed in olive oil with onion and tomato. 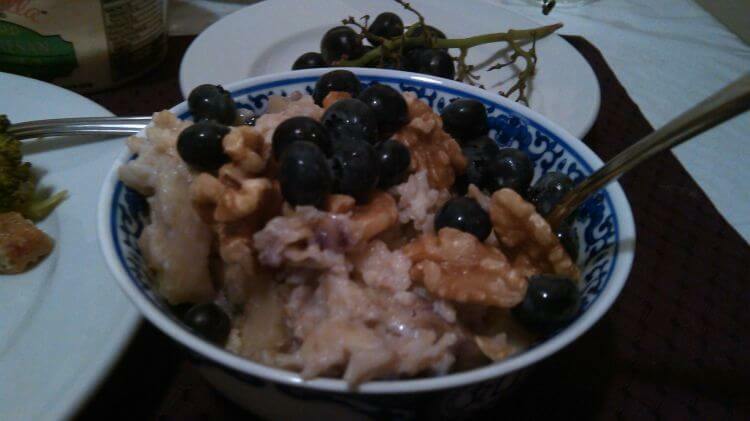 A cup of steel cut oatmeal topped with banana, walnuts and grapes. BR liked it, he said that it hit the spot and kept him going for the entire morning. He told me that he was not hungry for lunch, so I did not push it, just told him that I wanted him to still have some fruit and nuts next time he got hungry. He had a banana and peanut butter as well as pistachios. With that, I took the train over to BR's home. By the time I got there, he had already walked for an hour, an easy walk, I specifically did not want him to get exhausted, just nice and easy and he was pretty ecstatic when I met him. Despite my telling him that he did not yet lose much fat weight, he felt better, a good night sleep, a good walk, real food, a happy wife, he is on a roll. Here is the simple omelete prep that I showed to BR. 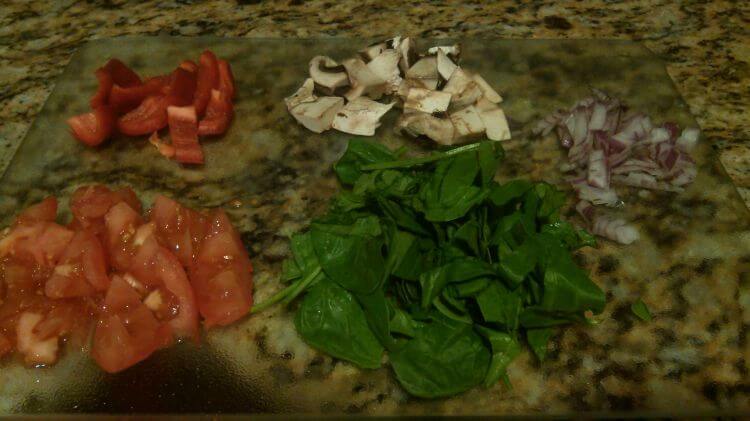 Take a couple of slices of onion, red onion in this case, chop, 2 steak sized portabello mushrooms, chop, a third of a red pepper and chop, couple of slices of tomato and chop and a handful of spinach and chop. I think this might have been overkill, but use at least two different vegetables like onion and tomato. Once he did that, I had him put a tablespoon or so of extra virgin olive oil into a pan and sautee the vegetables starting with the onion for a minute on a medium flame. Next he put in two organic eggs that have no added hormones or pesticides, a tablespoon of parmesan cheese. Besides preparing the omelete, I showed him how to make a simple oatmeal. 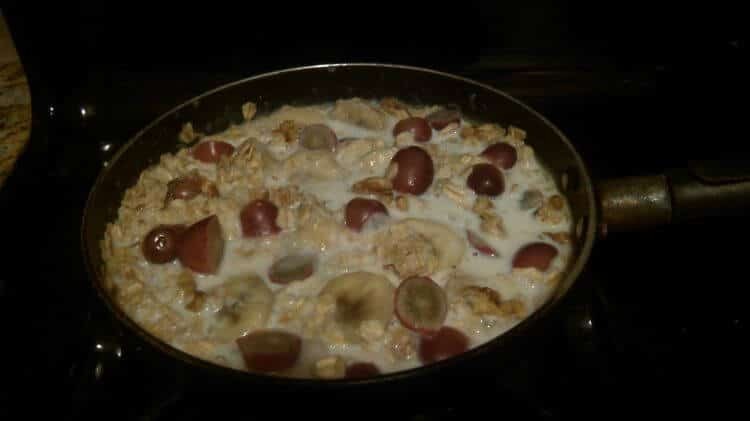 A cup of organic 1% milk bring to a boil in a sauce pan, add half a cup of old fashioned oats, one sliced banana, a handful of walnuts and a handful of grapes. That is it! Too bad he forgot to send a picture! Lets see how his sleep goes tonight, so far he is doing great. Brian was shocked this afternoon when he called me up to tell me that he was now at 196.7lbs, and that is after a lunch with his wife of oven baked salmon, grilled mushrooms and cauliflower with sesame tahini. On top of that he had a pretty filling dinner last night of eggplant and salmon, not to mention pistachios and some peanuts whenever he started to feel hungry. 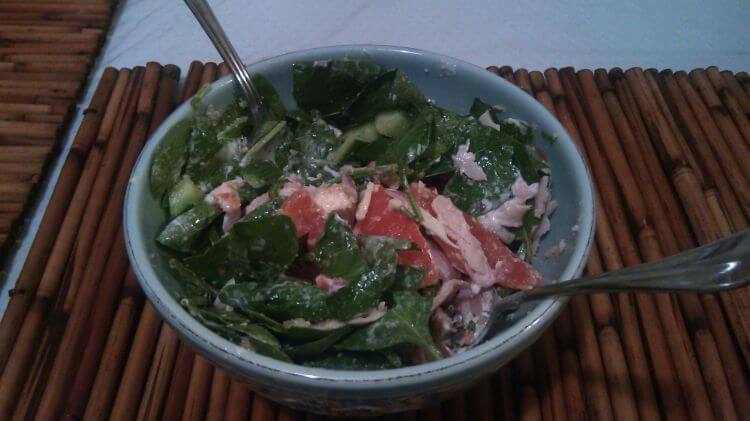 I showed Brian how to make this very simple ‘How much weight can I lose in a Month' dinner. Microwave a head of broccoli in water for a couple of minutes. Sautee the broccoli in extra virgin olive oil and if you want to add garlic or onion, your choice. 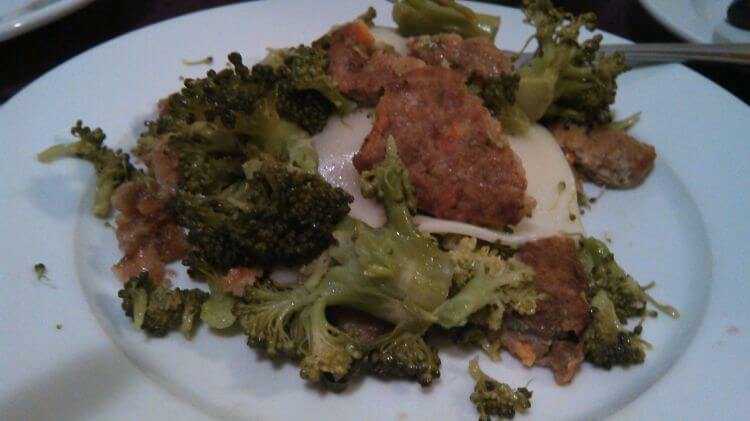 Add a couple of garden veggie burgers or whatever type that you like with the broccoli and cover the pot. At the same time, if you did not already have oatmeal for the day and you want some, go for it, all you have to do is bring a cup of 1% organic milk to a boil, stir in half a cup of old fashioned oats, add one sliced banana, a cup of grapes and top with a handful of walnuts. 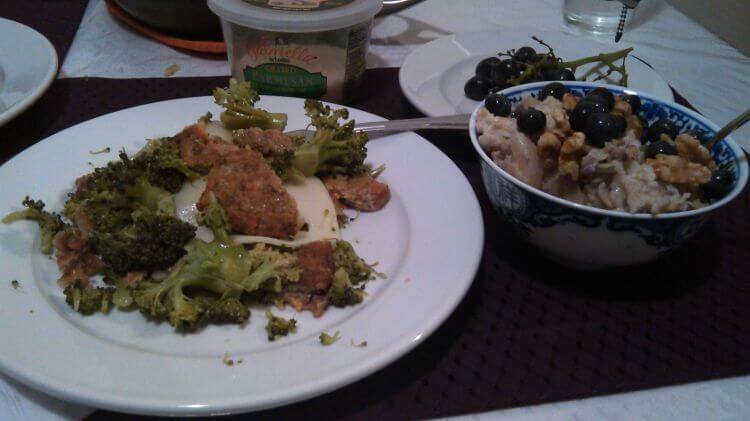 Shock of all shocks, Brian is quite happy that even after quite a filling dinner last evening, just look above, a full cup of oatmeal, blueberries, grapes, banana and walnuts with 2 veggie burgers and broccoli, he still lost another half a pound. To say that Brian is very motivated is an understatement. He started off great again today, got a good sleep from 11pm last night till 6 this morning. I want to see him scale that back a little to 10pm if possible or go from 11pm to 7am so he can get a good 8 hours. Brian is doing great. He is at 196.5lbs at the beginning of his 5th day. 45.1lbs of fat which is down from yesterday, 23% fat which is down from yesterday, 56.2% water which is up and a BMI of 25.5. He did another 60 minute walk today and 20 pushups. He is creating new and good habits and has not had any junk food for almost 5 full days and is down 8.5lbs from where he started by the end of Sunday night when he could barely move from a binge. His wife has been the biggest supporter and she told me that even though yesterday was her birthday and she offered him cake, he still did not go for it, just a very little piece. Even better, he is still going to sleep early and his wife also said her sleep is better because he is not SNORING like a cow and she barely hears him during the evening. That is not the case when he is not eating well. Over the weekend, Brian went from how much weight can i lose in a month to how much weight can I gain in a month! Big problem. He told me this morning that over the weekend he put on over six pounds, yikes! Wow, how does that happen? Pretty simple, too much food. He went back to bread, then to cookies, then to potatoes, then up six pounds. For now, I asked him to please take a good shower, clean up, eat an apple, drink water and read the articles that I have written about how to stop bingeing. I told him in the mean time to start thinking like a very fit and in shape person. Think how they think, imagine how they think and eat. I will be writing more about this subject for him and everyone else, but to fight depression and get in shape, we have to start thinking like a person who wants to be in shape. If you want to be fat, then we think and eat like a fat person who is seduced by food, the wrong type of food. If we want to be lean and powerful, then we have to think about food like a person who is eating to build the best body possible, not to have the best dessert possible. More to come. I also told him to stop sulking. Just change the attitude and start fresh now! I suggested to Brian that he cut out oatmeal in the mornings. I would have liked him to be able to use oatmeal, however it appears that he cannot handle even that amount of carbohydrates before he starts craving more. So, that is what he did yesterday and today. Thankfully he is back under 200lbs, as he binged the whole weekend back up to 206lbs. I asked him to read my post on how to stop binge eating. Yesterday he was barely hungry, of course not, he pigged out the entire weekend, no good. But today he got himself back into the gym for an hour on the treadmill this morning, an egg omelette for breakfast, a whey protein shake for snack and tuna salad for lunch and some almonds for another snack. I think this time he is going to make it, he knows that he just cannot process the carbs properly, most likely he is insulin resistant and on his way to type 2 diabetes if he does not get his weight under control. I had him visit his doctor for blood test and he will find out the results in a couple of weeks.